If you love raspberries, blackberries and loganberries, then try growing a boysenberry, a combination of all three. How do you grow boysenberries? Read on to find out about growing a boysenberry, its care, and other boysenberry plant info. What’s a boysenberry? 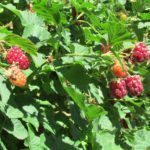 As mentioned, it’s an amazing hybrid berry comprised of a mix of raspberries, blackberries and loganberries, which in themselves are a mix of raspberries and blackberries. A vining perennial in USDA zones 5-9, boysenberries are eaten fresh or made into juice or preserves. Boysenberries look much akin to an elongated blackberry and, like blackberries, have a dark purple color and a sweet flavor with a hint of tartness. Boysenberries (Rubus ursinus × R. idaeus) are named after their creator, Rudolph Boysen. Boysen created the hybrid, but it was Walter Knott of Knott’s Berry Farm’s amusement park fame, who launched the berry to popularity after his wife began making the fruit into preserves in 1932. By 1940, there were 599 acres (242 ha.) of California land dedicated to cultivating boysenberries. Cultivation trailed off during WWII, but peaked again in the 1950’s. By the 1960’s, boysenberries fell out of favor due to their susceptibility to fungal diseases, difficulty in shipping from their delicate nature, and general high maintenance. Today, most fresh boysenberries can be found at small local farmers markets or in the form of preserves from berries grown primarily in Oregon. New Zealand is the largest producer and exporter of the berry. Boysenberries are high in vitamin C, folate and manganese and contain quite a bit of fiber. When growing a boysenberry plant, select a site in full sun with well-draining, sandy loam soil that has a pH of 5.8-6.5. Don’t select a site where tomatoes, eggplant, or potatoes have been grown, however, as they may have left behind the soil borne verticillium wilt. 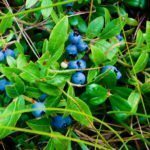 Plant boysenberry plants 4 weeks before your area’s last frost date. Dig a hole 1-2 feet (30-61 cm.) deep and 3-4 feet (about 1 m.) wide. For row planted plants, dig holes 8-10 feet (2-3 m.) apart. Place the boysenberry in the hole with the crown of the plant 2 inches (5 cm.) below the soil line, spreading the roots out in the hole. Fill the hole back in and pack the soil firmly around the roots. Water the plants in well. As the plant matures, it will need support. A three wire trellis or the like will do nicely. For a three wire support, space the wire 2 feet (61 cm.) apart. Keep the plants evenly moist, but not wet; water at the base of the plant rather than overhead to avoid leaf disease and fruit rot. Feed boysenberries with a 20-20-20 application of fertilizer in the early spring as new growth appears. Fish meal and blood meal are also excellent nutrient sources.